A second case has emerged of an airline passenger who transited through Heathrow Airport and later tested positive for the lethal Middle East Respiratory Syndrome (Mers) virus. Public Health England said the person flew in from Jeddah, Saudi Arabia on 1 May and travelled on to the US. It said the risk of transmission was "considered extremely low". However, it was working with Saudi Airlines to contact UK passengers who had sat near the person concerned. Mers belongs to the coronavirus family that includes the common cold and Sars, or severe acute respiratory syndrome, which caused about 800 deaths globally in 2003. More than 100 people have died of Mers to date. The virus causes symptoms including fever and kidney failure. Health officials say it is not highly contagious and appears to spread only through close contact. But there is no known cure. Professor Nick Phin, head of respiratory diseases for Public Health England, said the risk from the latest case was "very low". "We will be following up with any UK passengers who were sitting in the vicinity of the passenger with Mers-CoV, as a precautionary measure," he said. The passenger arrived in London on flight SV113 and travelled on to Florida in the US. "Any UK-based travellers who become unwell with a fever, cough or shortness of breath within 14 days of being in the Middle East should make sure they call their doctor and tell them where they have travelled," said Prof Phin. "Although the source of Mers-CoV is currently unknown, there is growing evidence of the possible role of camels in transmitting Mers-CoV to humans. "We advise travellers, particularly those with underlying or chronic medical conditions, to avoid contact with camels in the Middle East. "All travellers should practice good hand and respiratory hygiene to reduce the risk of respiratory illness." 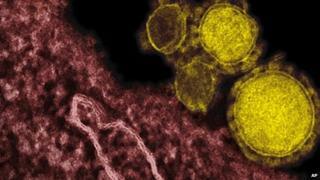 No cases of Mers in the UK have been detected since February 2013, Public Health England said. The latest case was the second within a week in which a passenger passing through Heathrow was later found to be infected. The patient in the first case, who was travelling from Saudi Arabia to Indiana in the US, now says he has recovered.